You don’t have to be a master carpenter to build a birdhouse. Follow these tips to make a simple birdhouse for your yard out of a gourd or an empty coffee can. 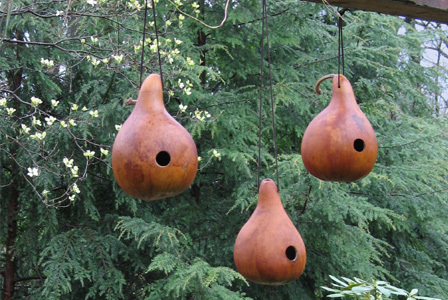 A large gourd can make a perfectly good birdhouse that will last for years. Use the expansion bit on your electric drill to cut a hole slightly above the center of the gourd to create the entrance to the birdhouse. Depending on the size of the birds in your area, you will need a hole that is 1-1/4 to 2-1/2 inches in diameter. Then use a serrated knife to break up the flesh and clean out the inside of the gourd. Note: If the gourd is dirty on the outside, use a wire brush to clean the surface dirt and then soak the gourd in a 10 percent solution of bleach and water for 15 minutes. Drill two quarter-inch diameter holes near the stem of the gourd. Unwrap the wire hanger and string it through the holes to create the loop for hanging. Drill four 3/8-inch holes on the bottom and two 3/8-inch holes on the sides of the gourd for drainage and ventilation. Lightly sand the outside of the gourd with sandpaper to help the primer and paint stick to the surface. Use your paintbrush to apply a coat of oil-based primer. Allow it to dry, then apply two coats of enamel paint. Keep in mind that light colors will help reflect the sun and keep the inside of the birdhouse cooler. Hang the birdhouse on a branch or on a post approximately 10 feet from the ground. You can create a birdhouse that looks like a bumblebee with just a coffee can and some paint. This is a fun project to do with your kids. Wash and dry your coffee can. Using the scissors, cut a hole near the middle of the coffee can lid to accommodate the size of birds you are trying to attract. A 2-inch hole is usually sufficient. Below this hole, punch another smaller hole with a paper punch. Paint the front of the lid black. Remove the paper wrapper from the can, if there is one. Using the lines of the can as a guide, paint black and yellow stripes on the can. To get crisp, straight lines, paint the entire can yellow and allow it to dry. Then place masking tape around the can at intervals, and paint the places that aren’t covered by masking tape with black paint. Allow the paint to dry, then remove the tape. You may need two to three coats of each color. When the paint is completely dry, put the lid back on and spray the entire can with an outdoor, waterproof sealant. Glue two large googly eyes above the birdhouse entrance. Glue the dowel into the hole that you punched with the hole punch. Fold a pipe cleaner in half to form the bee’s antenna. To make the ends curly, you can wrap the pipe cleaner around a pencil. Glue the pipe cleaner to the lid, positioning it over the googly eyes. Create the wings by folding a square of white fun foam in half, then cutting out a wing shape. Open up the foam and glue the wings to the top of the can. Use an electric drill to create two holes fairly close together on the top of the can, near the wings. String the twine through the holes and knot it to create the loop to hang your birdhouse. Hang from a branch in your yard approximately 10 feet from the ground. This project was adapted from Simon & Schuster Little Green Books.